26 Feb Drinks in the sun? 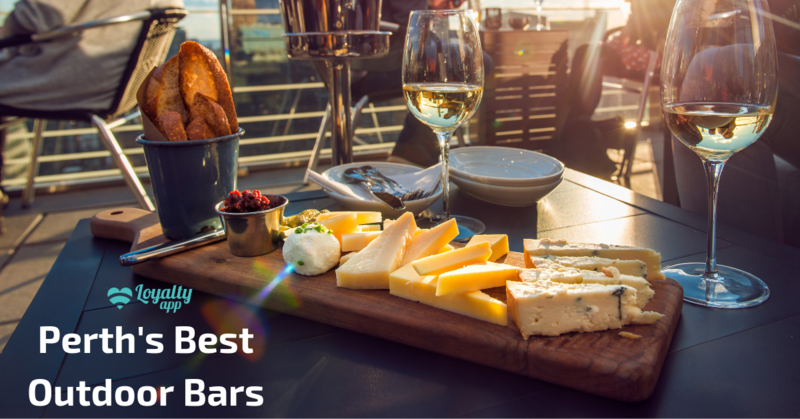 These are the best outdoor bars in Perth! Alcohol tastes better outside… prove us wrong! What’s better than a lovely beverage with a backdrop? Want to sip some spirits while soaking up the sun or maybe a couple of perfect pints overlooking the Perth cityscape? With so many great venues to choose from it’s definitely worth getting out into the West Australian weather with a refreshment in hand. Enjoy catch up drinks, birthday beers, or a quiet cocktail in some of Perth’s best outdoor bars. Right in the heart of the city lies this venue that provides wonderful views of the Perth City skyline. A flight of stairs above the Perth Train Station, The Aviary offers the largest rooftop space in WA with trees, grass and laid-back furniture creating a peaceful outdoor space. Perfect for any mood or occasion, the beer and wine list is as lofty as the setting and the cocktail options will have you reaching for the stars. A great selection of food choices back up the already broad menu. Tucked away amongst the rooftops of Northbridge, this cosy little bar is perfect for a catch up with close mates. The cocktail list may short but oh it’s sweet and it changes all the time. A range of wine, craft beers and cider complete the set. A bite to eat with your beverage? Flipside burgers has got your back! A full range of their burgers can be ordered from the bar. Oh boy! A three-storey bar, in the city centre, with rooftop views of the stunning skyline; sounds almost too good to be true. It’s real and it’s called Prince Lane! This stylish spot (formally The Emerson Bar) offers a different vibe on each floor with the first floor ideal for a cheeky after work drink and the second floor providing a more private space for a quiet cocktail. Experience the next level atmosphere by heading up to the top floor and enjoy a luxurious tropical vibe overlooking the city. Want something a bit further south? The Left Bank in Fremantle is the prime spot for a great pub feed and lively atmosphere. Resting on the banks of the Swan River, this large pub has something for everyone. Watch the latest sports on one of the many TV’s, enjoy the harbour views on the balcony or catch up with a group of mates in the beer garden! Like a true Aussie pub, you’ll find a huge selection of beers, wines, ciders, spirits and cocktails to please any palate. On the well-known hotspot Beaufort Street resides this iconic Perth pub, The Brisbane Hotel. The spacious beer garden provides the perfect location for a group to mingle or head inside for a quality meal. Upstairs you’ll find Lazy Susan’s Comedy Den if you’re after a night filled with hearty laughter. It’d be easy enough to spend the whole night at this bustling venue, but if kick-ons are your thing, Northbridge is only 1km away. Big night planned? Stay overnight at the Citylights Hotel only 1km from the city centre and earn $20 Loyalty app dollars per $100 spent! Don’t forget you receive other exclusive offers at hundreds of merchants if you’re a member of Loyalty app. Download Loyalty app today from the App Store or Google Play and start earning and using your reward points.